The top 12 earners on the BBC’s latest list of star salaries are all men. Claudia Winkleman is still the top woman, on £370,000-£379,999. Mary Berry and Newsnight’s Emily Maitlis are among eight women to have joined the list. Winkleman was eighth last year but has now dropped to 13th as a result of a shake-up of the corporation’s structure. The BBC said the published salaries do not yet fully reflect some pay rises and pay cuts, which will not filter through until next year’s list. 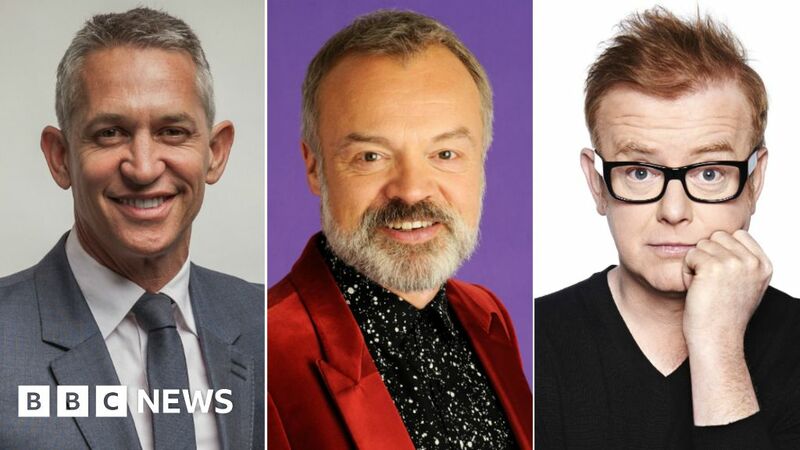 This is the second year that the BBC has published the salaries of its best-paid presenters, although actors, comedians and some hosts have been removed this time as a result of the BBC Studios change. Last year’s list sparked an outcry about gender and ethnic inequality because the top of the list was dominated by white men and because some men were shown to have been paid more than female co-hosts. Last year, the top seven were all men. This year’s list includes on-air presenters who earned more than £150,000 in the financial year 2017/18 from news, sport and radio as well as some TV entertainment shows. Director general Tony Hall said the BBC was “making progress” and that he wants a 50/50 split on the list as a whole, but that “these things take time”. The BBC has pledged to close the gap by 2020. But Woman’s Hour presenter Jane Garvey, who is one of the eight women to join the list, told Radio 4’s PM programme the pace of change was “absolutely glacial”. The other new entries include Europe editor Katya Adler and Radio 4 presenter Sarah Montague, with Maitlis earning between £220,000-£229,999 to make her the highest new name. Four men have also joined, including BBC media editor Amol Rajan on £200,000-£209,999, which also covers other radio presenting work. Of the 12 people who have moved down the salary bands because their pay has dropped since the previous list, eight are men. But four of the five to have moved up the pay bands are also men. Those moving into a higher salary bracket include Radio 2’s Steve Wright and Ken Bruce; Radio 1’s Nick Grimshaw; and Middle East editor Jeremy Bowen. The only woman to move up a pay band is Sophie Raworth. Some names have dropped down or been removed from the list since last year because they work for BBC Studios, which has been classed as a commercial entity since April 2017. As part of its latest disclosures, the corporation also published figures for 2018-19 to show it is on the way to rectifying the gender imbalance. Excluding BBC Studios, 59% of on-air figures earning more than £150,000 in the current financial year are men, it said. That compares with 76% in 2016-17. He added: “We are making progress and you must understand that. We’re trying to get a balanced range of men and women and their pay right across the organisation. The salary details were published in the BBC’s latest annual report, and come a week after the corporation said its overall median gender pay gap had reduced from 9.3% to 7.6%. And it comes two weeks after former China editor Carrie Gracie received an apology and back pay from the BBC after discovering on last year’s list that she had been paid less than her male counterparts. In last year’s report, Claudia Winkleman was the best-paid woman, earning between £450,000-£499,999. This year, she is still the top earning female star, but has slid down the rankings with earnings between £370,000-£379,999. That means the top of this year’s list appears more male-dominated than last time. Winkleman’s Strictly co-host Tess Daly has dropped off the list all together, as have The One Show’s Matt Baker and Casualty’s Derek Thompson, among others. That’s because most entertainment, factual and drama programmes are made by BBC Studios which, as a commercial entity, no longer has to declare the salaries it pays its staff because it is competing with other production companies. So Claudia’s actual earnings will exceed the amount given in this year’s annual report. The same can be said for the likes of Graham Norton, Mary Berry and Fiona Bruce, who also make shows for BBC Studios. This year’s list doesn’t fully reflect the pay cuts for some male presenters – and pay rises for some women. In a number of cases, these will be enacted over several years. For example, John Humphrys has seen his published salary drop from £600,000-£649,999 to £400,000-£409,999. But in 2018-19 – which will be shown on next year’s list – his pay for the Today programme will be in the £250,000-£299,999 bracket. Similarly, Nicky Campbell and Huw Edwards have also taken pay cuts, which have started to filter through to the list – but are being staggered over a number of years. Meanwhile, the BBC annual report also revealed that the corporation received 48 complaints of sexual harassment and assault in 2017/18. Nine resulted in formal cases or disciplinary action, the BBC said. The remaining 39 did not for a variety of reasons – including the complaint being withdrawn or the individual being complained about no longer working for the BBC.